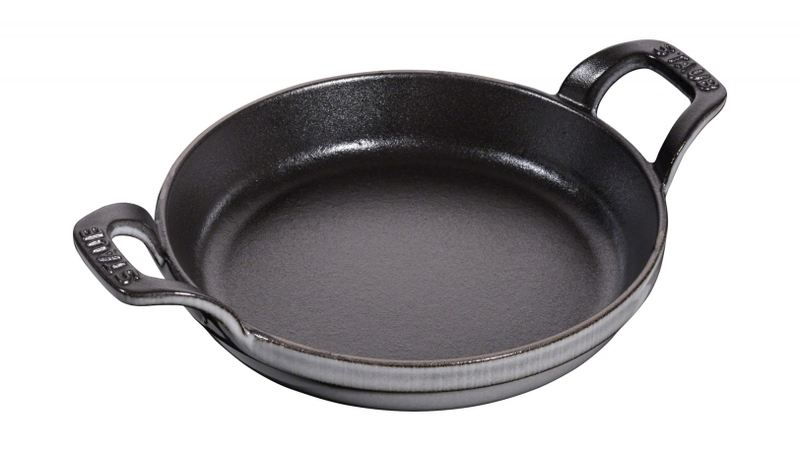 Small but mighty: this 16 cm diameter, 0.4 L capacity, round, graphite grey gratin dish from Staub is perfect for small portions of food. Beautifully presented individual portions of lasagne, moussaka, pasta bake and potato gratin are just some of the dishes it can be used for. Professional chefs from all over the world swear by Staub's cast iron cookware due to its excellent cooking and heat-distributing capabilities. The graphite grey, cast iron gratin dish therefore cooks gratins gently and evenly on all sides, resulting in succulent food of incomparable flavour. It is also a very robust, durable material with an integrity that makes it a pleasure to cook with. The round graphite grey gratin dish can be stacked and features practical handles on each side so it can be handled more easily. It can also be used on all heat sources and can of course be placed in the oven. This high-quality cast iron gratin dish is perfect for making tasty oven-baked dishes, succulent gratins or delicious oven-baked desserts and for presenting them at the dining table.